The brain’s biological clock stimulates thirst in the hours before sleep, according to a study published in the journal Nature by McGill University researchers. The finding, along with the discovery of the molecular process behind it, provides the first insight into how the clock regulates a physiological function. And while the research was conducted in mice, “the findings could point the way toward drugs that target receptors implicated in problems that people experience from shift work or jet lag,” says the study’s senior author, Charles Bourque, a professor in McGill’s Department of Neurology and scientist at the Brain Repair and Integrative Neuroscience Program at the Research Institute of the McGill University Health Centre. Scientists knew that rodents show a surge in water intake during the last two hours before sleep. The study by Bourque’s group revealed that this behavior is not motivated by any physiological reason, such as dehydration. So if they don’t need to drink water, why do they? The McGill team, which included lead author and Ph.D. student Claire Gizowski, found that restricting the access of mice to water during the surge period resulted in significant dehydration towards the end of the sleep cycle. So the increase in water intake before sleep is a preemptive strike that guards against dehydration and serves to keep the animal healthy and properly hydrated. Then the researchers looked for the mechanism that sets this thirst response in motion. It’s well established that the brain harbors a hydration sensor with thirst neurons in that sensor organ. So they wondered if the SCN, the brain region that regulates circadian cycles — a.k.a. the biological clock — could be communicating with the thirst neurons. 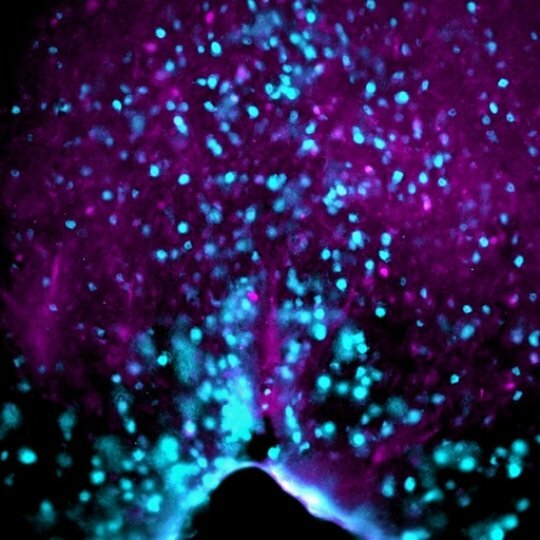 To explore if vasopressin was stimulating thirst neurons, the researchers employed optogenetics, a cutting-edge technique that uses laser light to turn neurons on or off. Using genetically engineered mice whose vasopressin neurons contain a light activated molecule, the researchers were able to show that vasopressin does, indeed, turn on thirst neurons.